Under counter wine cooler refrigerators offer space-efficient wine storage. They are designed to fit under the counter in a kitchen providing cool and dark environment for storing your bottles of wine while using the space available in your home efficiently. Undercounter wine coolers, wine refrigerators come in various capacities, dimensions and decor. Usually they have either 15″ wide or have 24″ width and are meant to be installed under a kitchen counter. All undercounter wine refrigerators have front ventings so the hot air generated inside the unit can freely dissipate in the air. [/ezcol_1half_end]This page includes reviews of some of the best under counter wine coolers in various sizes to help you select one that best suits your needs. 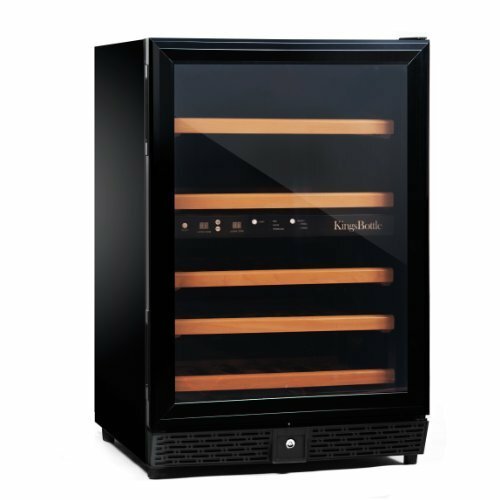 If you aren’t a dedicated wine collector yet and want to have a nice-looking wine refrigerator built under the counter than a modest size wine cooler with around 20-30 bottles storage capacity is the unit you need. The Vinotemp VT-26 SB Under Counter Wine Cooler is a stylish 15-inch wide wine refrigerator with black cabinet and stainless steel framed double paned glass door. This is a nice compact wine storage unit that fits well in any kitchen setting. Its dimensions are the same as that of a kitchen trash compactor’s so it’s a nice compact appliance with narrow width. The 7 slide-out metal shelves with natural wood trims add to the attractiveness of the appliance. It has a cool-looking digital display integrated into the wood front of one of the middle shelves. The door can be locked so you can keep your wine collection safe from unwanted access. The door also has a stainless steel bar handle. The digital thermostat lets you set the cooler to temperatures within 45 – 65 deg. Fahrenheit by pressing the Up and Down arrows on the control panel. The Vinotemp VT-26 model is a compressor-run wine refrigerator, contains freon as cooling agent. Price of Vinotemp VT-26 Undercounter Wine refrigerators: available for around 700-1100 $. The Danby Silhouette DWC1534BLS single-zone wine cellar fits perfefctly under a kitchen counter with its 15″ width. The Vinotemp VT-52 wine cooler is a larger model with 52 bottles capacity. 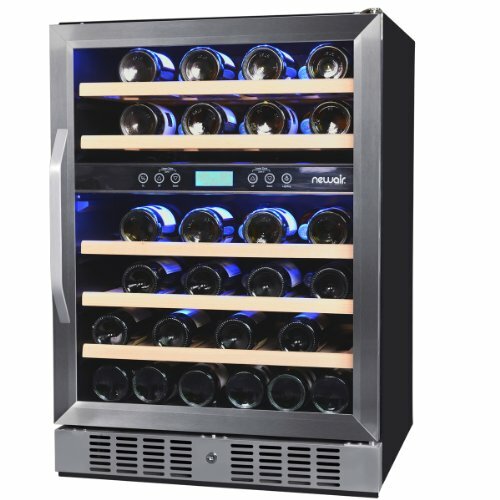 The U-Line 1115WC 24-bottle wine cooler in the Origins series offers great technical features like the 3 temperature zones, and 50 % relative humidity inside the cabinet. The triple zones allow you to store a wide selection of wines at their most suitable serving temperture or stock the cooler up with only one type of wine for longer term storage. The max. storage capacity is 24 bottles of wine (standard 750 ml bottles). The less than 15″ width of this elegant undercounter wine cellar makes it perfect for a built-in use. Depth: 23 1/8″The top zone is most suitable for keeping red wines at approx. 55 °F (13 C), in the middle where the temperature is kept at cc. 50 °F(10 °C) you can put your favorite whites while the bottom zone – cc. 45 °F (7 °C) is perfefct for sparkling wine. Setting the desired temperature is easy with the push button digital controls mounted in the bottom display shelf. You can set the temperature only for the middle zone the other two zones’ temperature will be adjuted automatically. The display shows temperatures of all zones both in deg. Fahrenheit and in deg. Celsius. The interior lighting turns on automatically when you open the door but you can set to illuminate the interior when the door is closed (It turns automatically after 4 hours.) to provide an attractive display of your wine collection. Another useful feature of the U-Line origins 24-bottle undercounter wine cooelr is the so-called Sabbath mode (not Star K certified):set to this mode all lights and control displays are turned off if it’s require by the user due to religious reasons (the cooler resets automatically after 36 hours). There are 6 wire racks with maple tree fronts can be pulled out all the way so that you can read the wine lables and conveniently acces the bottles. The natural maple wood fronts can be stained with water-based stains to match your home decor. You can replace the wooden fronts with other woods or other material. Although U-Line wine coolers are compressor-operated, they work rather silently and provide vibration-safe environment for the stored wines. All-black decor. black vynil clad steel cabinet with black trimmed tempered, tinted glass door. The black vynil coating is finely textured and it’s more resistant to scratching, peeling and flaking. The door of the black model has recessed handle in the top frame. Black cabinet with brushed aluminum door frame with stainless steel like finish, and with black front grille- the door has a bar handle. More Stainless Steel Wine Cooler Refrigerators. The door is field reversible (except for stainless st. models) so that you can have the direction of door opening changed. The door has self-closing mechanism. All models come with factory-installed, durable leveling legs for more precise undercounter placement. 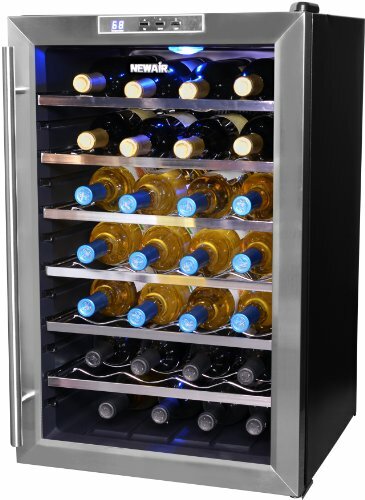 Since the U-Line Origins 24-bottle wine cooler is designed for built-in use it doesn’t require additional clearance around the sides or top or at the back of the appliance. The recessed front grille must be left unobstructed so that the hot air can be freely vented. Price of the U-line Origins Wine Captain 1115WC 24-bottle undercounter wine refrigerator: cc. 1100- 1500 $ depending on the decor. 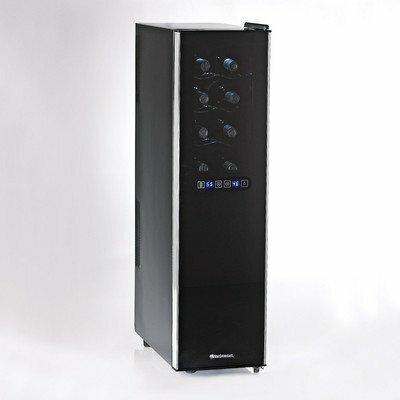 N’FINITY 23-Bottle Wine Cooler – two temperature zones, hardwood shelving digital controls and dispaly. the Viking Under Counter/Freestanding Wine Cellars are great small-capacity units for built-in use. See reviews of other U-Line Wine Refrigerators. Browse reviews of Dual Temperature Zone Wine Coolers. Medium capacity under the counter home wine cellars allow you to store around 30-50 bottles of wine in safe environment. You can select a single zone unit or opt for a dual zone wine refrigerator if you prefer to drink both reds and whites. The Danby Silhouette DWC518BLS under counter wine cabinet is an elegant, professional looking wine storage unit with 24″ width. It can accommodate up to 51 bottles of wine in two independently controlled zones. 6 stainless steel-trimmed partially roll-out wood shelves (2 in the upper zone for reds and 4 in the lower zone for white wines) match the stainless steel frame of the glass door. The black cabinet has an all-balck interior. The door glass is tempered for ensuring better thermal insulation and slightly tinted to filter out UV rays. The door hinge is reversible allowing customers to choose either left-hand or right hand opening. You can lock the wine cooler with the integrated door lock (good thing to do if you have children). The semi-flush cupped door handle in the top door frame lends a clean design to the unit. The control panel is under the bottom shelf of the top zone. The blue display indicates the set and current temperatures in both zones in an easily readable form. There are two buttons for temperature setting: the Set Upper for the top zone (for red wines) and Set Lower for the bottom zone. The set temperature can be viewed when you briefly press either the “Set Upper” or the “Set Lower” button. The set value will flash on the screen for approx. 5 seconds before the diplays resumes shoing the current temp. inside the cabinet. When you plug in the cooler for the first time the temp. will be automatically set to 45 °F (7 °C) in the lower compartment and 54 °F (12 °C) in the upper compartment. The lowest end of the unit’s temperature range is 34 °F (4 °C) while the highest is 64°F (18 °C) The fan-forced cooling technology combined with digital thermostat ensures stable temperatures throughout the cabinet. Two humidity reservoirs are inluded that you can fill with water and place on The interior LED lighting shocases the wines nicely without generating heat. The lighting turns on automatically when you open the door, but it can be adjusted to be turned on with a light switch integrated in the front grille. The appliance comes with leveling legs. Price of the Danby 51-bottle, DWC518BLS model : cc. $940 – $1000 ($18.4 – $19.6 per bottle). Warranty: 2 years parts and labor. Some users reported that the shelves are difficlt to pull out. Another problem of this model according to some users is the noise generated by the 3 plastic fans for the internal air circulation. The N’FINITY line of wine coolers and storage cabinets by Wine Enthusiast offer versatility in storage capacity and placement. The smallest model stores 23 bottles while the most capapcious unit is holds up to 340 bottles of wine. All models have two independently controlled temperature zones for storing reds, whites and sparkling wine or champagne. The N’FINITY 50-Bottle Wine Cooler holds around 48-50 bottles of wine in its two compartments. The all-black cabinet with the tinted stainless steel framed glass door and the elegant hardwood shelves match easily with a modern kitchen decor. review of the U-line Echelon Series 2-Zone Undercounter Wine Cabinet. Browse other Dual Zone Wine Cooler Refrigerators by Danby. Review of the Electrolux ICON™ 48 bottle under counter wine refrigerator. Avanti 46-bottle 2-Zone Undercounter Wine Cooler Review. EdgeStar 46-Bottle wine fridge stores cc. 44-46 bottles in two independently controlle temperature zones. Summit undercounter wine refrigerators offer offer mid-size wine storage units (50-bottle capacity). 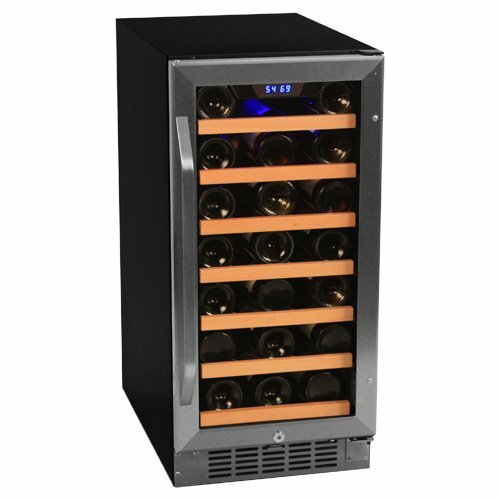 The Sub-Zero 424 Dual Zone Under Counter Wine Cooler can store up tp 46 bottles of wine. The GE Monogram Under Counter Beverage Center can store up to 10 bottles of wine and up to 126 12 oz. canned beverages. Although the more capacious wine storage units require more space there are some models designed for built-in, under-counter use. The Perlick 90-bottle Undercounter Wine Cabinet is a high-end home wine cellar offering exquisite style combined top-notch technology that satisfies the even the pickiest wine collector. Perlick’s wine storage units are known for their versatility and this modelis no exception. The standard model is single zone but you can opt for a dual zone one for some extra charge. Frestanding and outdoor models of the Perlick 90-bottle wine cooler are also available.